We have opted for one day Valparai package from Coimbatore, as promised the travels have stick to their deadline that a day before the trip day i received the vehicle and driver information. We were assigned one Mr. Prasanna as drive who was very professional, punctual & polite , his driving needs a special mention very skillful driver and was very patient. I would surely recommend Royal Travels to my friends. 1. All transactions need to be done via NEFT / RTGS / IMPS / Cheque / DD / only. 2. 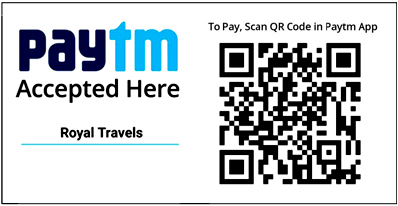 Kindly mention your name (or) Booking number in the comments while making NEFT/ RTGS online payment. 3. As per the new provisions of the Finance Bill 2017 (Section 269 ST in the Income Tax Act), Royal Travels will NOT be accepting any cash deposits in our bank accounts form 01 April 2017.